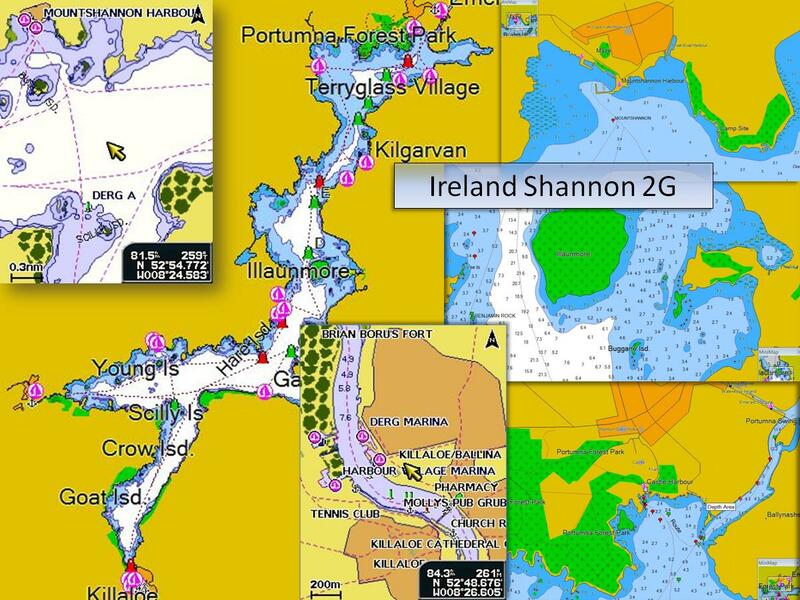 Ireland Shannon charts run on Garmin marine chart plotters, some Garmin Nuvi automotive models, Smartphones and Tablets running the Garmin BlueChart Mobile app. The charts are general information maps of the extensive Shannon and Erne inland waterway navigations. The charts show outlines of the River Shannon navigation from Leitrim to Limerick docks, and more detailed information for Lough Derg and Lough Ree including colour depth shading, depth contours, many navigation markers, spot depths and detailed layouts of public and private harbours. The charts show preferred tracks for many popular routes. NEW - The charts now inclide coverage of the Erne Navigation and the Shannon-Erne Waterway (SEW). Download Download chart from Garmin web site, lock to your chart plotter unit ID, copy onto your own SD or MicroSD card. SD Card Charts on SD memory card, not locked to unit. MicroSD Card Charts on MicroSD memory card, not locked to unit. HomePort Now supported by Garmin products on SD, MicroSD or Download Formats. NEW - Erne Navigation Coverage included from August 2015 free of charge on chartplotters with preloaded marine charts of UK and Ireland such as GpsMap 557, 451, 551, 556 and 750, 751. Also includes coverage of the SEW (Shannon-Erne Waterway). Garmin support Shannon Navigation maps on legacy data cards for discontinued products such as 276C, 2000, 3000 series. Contact Garmin dealers for details.